Simple knots may work, but this trick will help you quickly and easily remove and launder your Savvy Rest mattress pad. 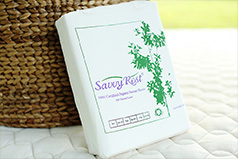 We highly recommend using a mattress pad so that your Savvy Rest organic mattress is properly protected. A mattress pad can also add slight cushioning, giving your mattress that extra luxurious feel. Our mattress pads are made with organic and natural materials that are both durable and safe for your home. In the video above, Dominick demonstrates how to secure one of our cotton mattress pads to a Savvy Rest mattress. Below are written instructions. Unfold your mattress pad and line it up with your mattress. At a corner, use a single strap to make a slipknot. Place this tie under the corner of the mattress but with the loop (slipknot) still visible. You will then thread the other tie through the slipknot. Make sure the knot is tight so that it will keep the pad in place. Repeat the previous steps on the remaining three corners of the mattress pad. It’s that easy to protect your mattress! When you’re ready to wash your mattress pad, simply pull the loose tail of the second slipknot for all four corners. Note: Only our cotton mattress pad is machine washable. 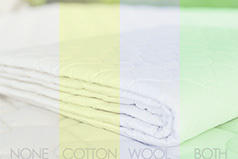 Please hand wash our wool mattress pad with mild detergent and line dry. Complete your natural bed with organic sheets, protective pads, allergy encasements and more.